Well, I just couldn't stand it.!!! I saw the card below designed by Jill Foster on the Penny Black Facebook page and absolutely fell in love with the color combo (I call her the Queen of Color)....so I had to make something like it. I have heard that imitating someone is a form of flattery...thanks Miss Jill for the inspiration! 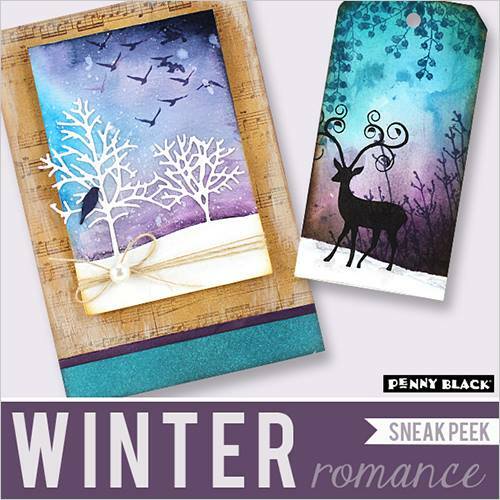 Not your typical Holiday colors.. yet it makes a gorgeous card! Main panel of card front is stamped using Festive Florals, then inked with Memento Peanut Brittle and Toffee Crunch with a bit of gesso added. The panel with the unusual Poinsettias was inked with Tim Holtz Peacock Feathers. Flicked plain water to achieve watercolor looking spots. The rest of this panel was inked with Memento Sweet Plum and Grape Jelly. Poinsettia was stamped with Grape Jelly. A few flicks from a paintbrush with Aqua paint. Wrapped twine and tied bow. Adhere to card front with foam adhesive. Stamped and inked a scrap of card stock for the Aqua panel at the bottom using the snowflakes from the Holiday Snippets set and a thin strip of Dark Purple card stock. Tiny tag was inked then heat embossed the sentiment. Unusual? Maybe, but this card is beautiful. What a joy it would be to receive! So glad to have found you through Simon Says Stamp's Monday Challenge. i am wondering if you would consider a trip north to Alabama so you could share your amazing talent and magic with me. 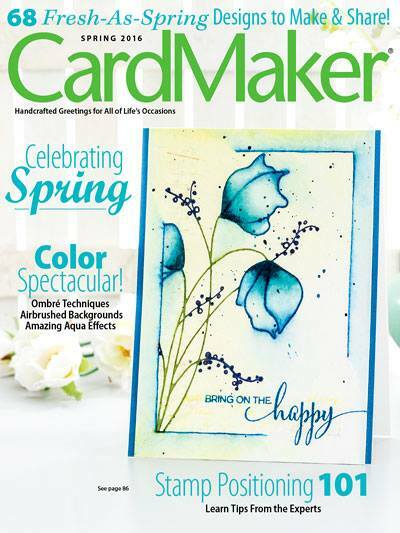 I just want to sit next to you while you make these incredible cards! The colors in this one are amazing. Today would be a good day for a visit if you are weary of heat .. it is in the 40's this morning!! Big hugs! Girl, I am TOTALLY flattered!!! And I just adore your card!! (I like it way more than mine!!) BIG hugs and love to you. :) Seeing this post today was a wonderful start to my weekend. 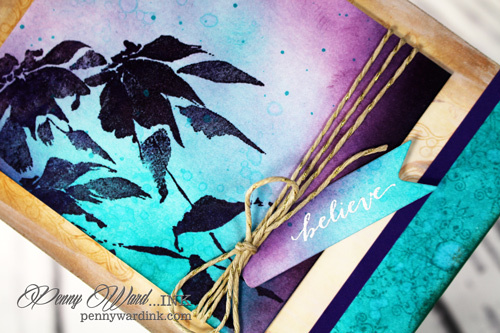 Thanks for joining us in this week's challenge at Simon Says Stamp Monday blog! Beautiful colors! They work so well with your silhouette. Penny this card is absolutely gorgeous! 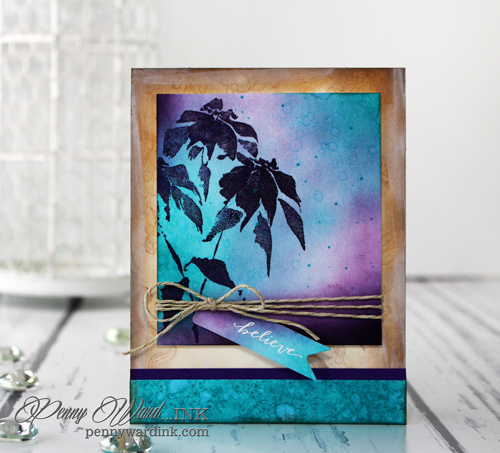 I love the color combination and that poinsettia stamp is so pretty! Thanks for playing along with us at Scrapy Land Challenge #27! 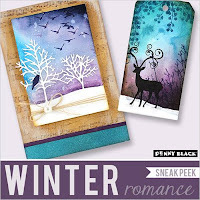 AWESOME - Color is just bursting on this card and bringing it to beautiful life!!! Love this and I have been enjoying seeing all your other cards but I am just struggling with life so I have not been making comments - sorry!!! Hope you have a wonderful week!! !